I have learned so many things this month! I have started rolling over like it is my job. I love playing on the floor with all my toys. I grab for things now - especially my bottle or anything else that looks like it. I give smiles and giggles all the time. I love to feel soft things, like Chyna's and Calvin's fur. And I love to play the piano with my feet in my crib! 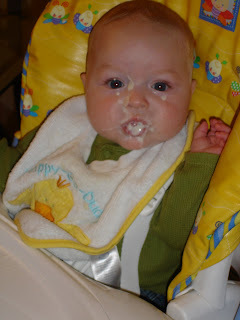 For my 5 month birthday, Mommy tried feeding me cereal again. And I liked it! SOOOOOO Cute!!! I love how Mason wears the cereal...it looks so good on him! 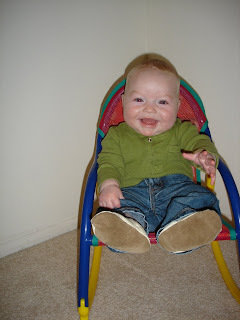 What a big boy in his chair...kena hora. O.K. 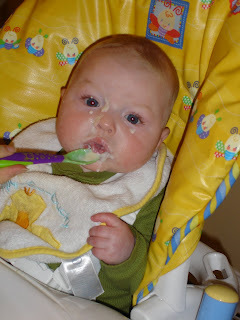 MAson-Here is the big question--What tastes better--M&M's or your cereal?? The way you wear it, I think you will choose the cereal! You are so adorable!